I have to say, I'm pretty sceptical about mermaids in YA fiction. I'm just not sure about it, so when I recieved Tempest Rising by Tracey Deebs for review last year, I wasn't 100% that I would read or review the book. 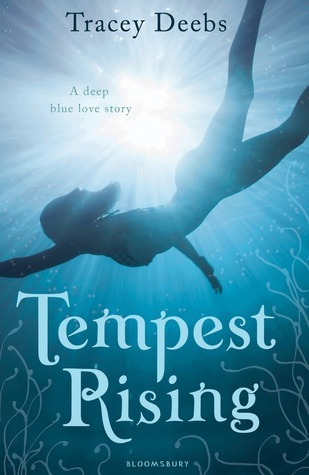 But around the same time, I picked up a copy of Forgive My Fins by Tera Lyn Childs and I loved that book, so I thought that perhaps I should also give Tempest Rising a chance. And I found myself surprised by Tempest Rising. It isn't nearly as fun or light-hearted a read as Forgive My Fins, and I found myself very confused - especially towards the end, but overall I did enjoy this book. I really enjoyed a lot of Tempest's relationship with surfer-boy Kai and also of her inner struggle to forgive and understand her mother's motivations for choosing the water over her family. Tempest is nearing her 17th birthday and she has always known that at the time she will have a choice to make. Stay on land with her father and her younger brothers or to choose the ocean like her mother did before her. Tempest has a lot of bad feelings towards her mother for the choice that she made and Tempest is certain of how she will choose when the time comes. Even though Tempest has a real affinity for the water and could spend hours surfing the waves, she still feel as though her mother's actions were self and equal abandonment towards her and her family. But when a hot and mysterious surfer boy, Kai, enters Tempest' life, she begins to question herself and the choice ahead of her. And it doesn't seem to be as straightforward as Tempest has been led to believe, as there is a dark force that seems after her. And when somebody Tempest cares about is attacked by this dark force, Tempest chooses the ocean. And in this choice, she discovers more about herself, about Kai and about her mother's decisions. I did enjoy this book, I really liked the surfing towards the beginning, and I found the relationship between Tempest and Kai to be quite sweet. The mythology of the mermaids and other underwater creatures was interesting and there is this obvious big build-up to explosive events that will occur throughout the rest of the books in this series. I'm intrigued. I think a lot of people are familiar with things like vampire and werewolf mythology so when it crops in books it's not that foreign. I've not had much experience with mermaids at all, so in some ways it was interesting to come across something very new. I haven't read any books with mermaids in them and I'm not entirely sure how they would work in a book format but I'm definitely intrigued by the sound of this book. I wasn't quite sure how it'd work out either, but I liked it!